We started the final day with ten players and Diaz entered just 9th in chips. He stayed out of the heavy action early, finding spots to add chips when he could including a bluff with Ten-Three. It wasn't until he got it all in with our Day 2 chip leader Nicholas Rampone that he took the chip lead for the first time. His got there on the turn against the of Rampone. However, it wasn't long before he got short again and in back to back hands had to come from behind in an all in preflop situation to chop both of the pots. But then it happened. Shortly after doubling up and reaching a million chips, Diaz flopped the nut flush against the second nut flush draw of Bill Chen. The two got it in and Diaz took a chip lead that he refused to relinquish. With play three handed, Diaz continued to put pressure on the two shorter stacks, Andrea Dato and Anders Meli. Dato tried to fight back but the aggressiveness of Diaz caught up with him. Anders Meli was able to gain a little momentum before Dato's bust but when the battle turned heads up, it was all downhill from there. Diaz poured on the aggression, forcing Meli to chip down further and further as the match progressed. On the final hand, Meli's couldn't hold against the holding of Diaz and we had a champion. When asked if he had expected to win a bracelet his year at the World Series, Diaz responded, "Actually, I expected to win two. I don't know why but I just did." Well, David Diaz, you are half way there. The three remaining players have returned from their break and cards are in the air. They have played two more levels just like that and the three remaining opponents will take a short 20 minute break. As you can see by the chip counts below, Andrea Dato will have to figure out what to do when he returns to get back into this match. Players have mostly been raising and three betting without a flop or showdown. But in this hand, our short stack, Andrea Dato, was able to take a little more than just the blinds. Dato raised his button to 80,000 and David Diaz called from the big blind. The board came as both players had checked through the turn. On the river, Diaz checked to Dato who bet 125,000 and Diaz made the call. Dato shipped the pot with the to pick up about 230,000 on that hand and get his stack back to around the 1 Million chip mark. Anders Meli raised his button to the standard, 80,000. David Diaz folded but Andrea Dato made the call from the big blind. The flop came and both players checked. Dato bet out 100,000 on the turn, a bet which Meli called. The river was the , both players checked and Dato showed for a missed flush draw. The King-high of Meli's was good enough to take the pot and make Dato's stack that much shorter. Of our three remaining players, David Diaz has arguably been the most fortunate with preflop all in situations today. His inferior Ace was able to catch up and chop with a stronger Ace against each of his two remaining opponents. Now it was Andrea Dato's turn to catch up, except he did it to Anders Meli, who must be wondering when it's his turn to get there. Meli raised his button to 80,000 and David Diaz re-raised from the small blind to 180,000. Dato took a look at his cards and quickly moved all in. Meli isolated by moving all in behind him and Diaz let go of his hand. Meli had the and was in good position to knock out Dato's . But the board paired twice by the turn as it ran out . The river bricked both players and the pot was chopped... again. David Diaz raised on his button to 80,000 and Andrea Dato folded his small blind. 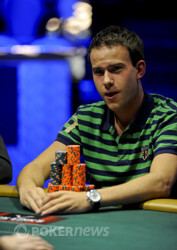 Andres Meli decided to three bet his big blind to 200,000 before Diaz four bet to 350,000. Meli thought for a bit before deciding to move all in to which Diaz mucked his hand. Meli picked up nearly 400,000 chips on that hand and is back within sight of our other two competitors. Anders Meli opened his button with a raise to 80,000. David Diaz got out of the way and Andrea Dato called from the big blind. The flop came and Dato checked to Meli who fired out 90,000. Dato took a chunk of green 25,000 chips and moved them in front of his cards. Meli quickly folded and is now clearly the short stack with 1.2 Million. He still has 30 big blinds left and is not in any immediate trouble. 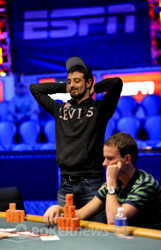 After Anders Meli folded his button, David Diaz raised to 105,000 from the small blind. Andrea Dato three-bet to 235,000 and action went back to Diaz. After thinking a moment and thoroughly looking over Dato's stack, Diaz announced he was all in. Dato immediately took off his hat and put down the hood on his sweatshirt. After tanking hard, including a count of Meli's stack, Dato let his hand go and Diaz' supports erupted in a roar. All three players have played tremendously well throughout the three days of play here in Event 12. As their reward, each of them have over 50 big blinds to play with. So far at the final table, the standard open has been a min-raise so they will have plenty of room in their stacks to play poker. Whoever does win this bracelet will be especially deserving having beaten two exceptional opponents with about even chip stacks heading into three-handed play. 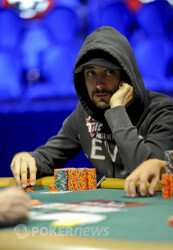 Right now it is David Diaz with the chip lead, holding about 45% of the chips in play. Anders Meli and Andrea Dato have about the same size stack and most imporantly, both are easily within striking distance of Diaz. 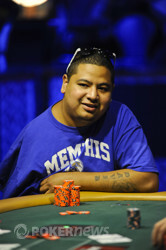 With just 345,000 left, Bill Chen moved all in and found a caller in, who else, David Diaz. The flop was kind to Chen who was ahead with K-high when it came . The turn was cruel to Chen though as the fell and left him with just the three remaining Kings. 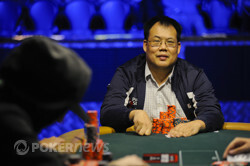 The river bricked with the and Chen was eliminated in 4th place. From the button, Bill Chen raised to 70,000 and David Diaz three bet to 190,000 from the small blind. The big blind folded and Bill Chen called. The flop was and David Diaz led out for 150,000. Within a few seconds Bill Chen announced he was all in and David Diaz snap called. Diaz had flopped the nuts and already had Chen drawing dead. Diaz started the hand with about 1.1 Million chips to Chen's 1.425 Million so we don't have a bust out yet, but Chen is hurting. Diaz now sits as the chip leader with 2.25 Million chips.